I think Dr. Corkin who began a scientific and legal association with Molaison is so cruel and her scientific research is so immoral…. She said that she received Molaison’s permission to extract his brain after his death but I wonder whether he could really truly meaningful permission given his illness. I felt really sorry for Mr. Molaison. He gained permanent brain damage due to the stupid Dr. Scoville and had been used by Dr. Corkin for his lifetime.. I think some scientist merely pursue their studies for their own fame or public good and do not care about one’s right to life.. Also, I wonder whether Mr. Molaison or his family has received any compensation from the doctors. Please share your opinion with me! Posted on July 27, 2011	by Julia J. When I was still a little younger and internet was new to the world I was actually one of the people who was really into that topic and I spent loads of time in front of the PC in order to install new programs, learn about computer hardware and software and I liked to play Computer games. When I grew older my time was limited because I found other hobbies more interesting. But as I stopped engaging in computer stuff new technologies were invented and I did not keep up with that development. Now I honestly have the feeling that I become like my mum who does not even know how to use the satellite TV. Of course, it is not that bad but there are so many programs on the market now which are very useful and facilitate your life but I am simply afraid to invest so much time in understanding these sophisticated seeming programs and applications. I like photography and always take many pictures when traveling. It is not always easy to handle all of them. Furthermore, many pictures need to be edited which I did not really do recently. But as I will travel again soon I decided to spend some time on exploring Google Picasa a little bit more. The program can be downloaded here (for free). 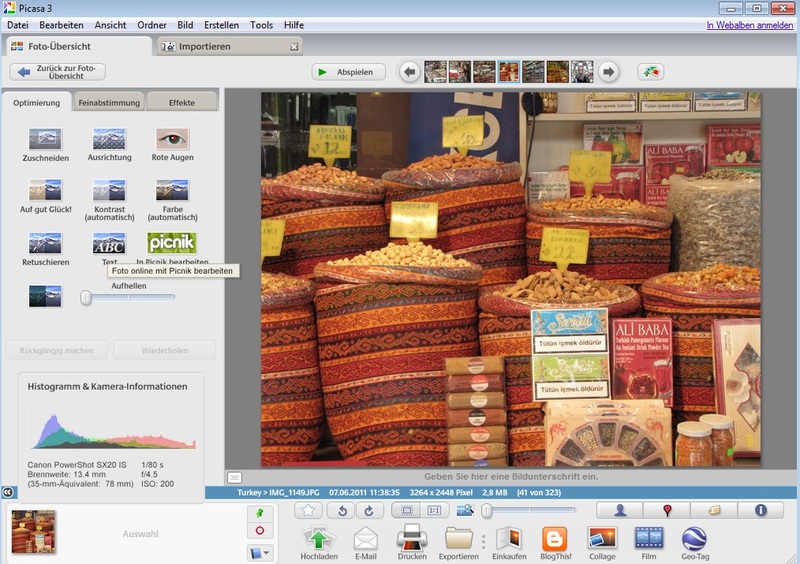 Picasa is basically an image organizer and viewer which combines photo editing and photo sharing. The name is a blend of “Pablo” and “Picasso”, an homage to the great artist. Since 2004 it belongs to the Google group. Picasa can scan all your hard drives for pictures automatically or you can choose which data should be imported. 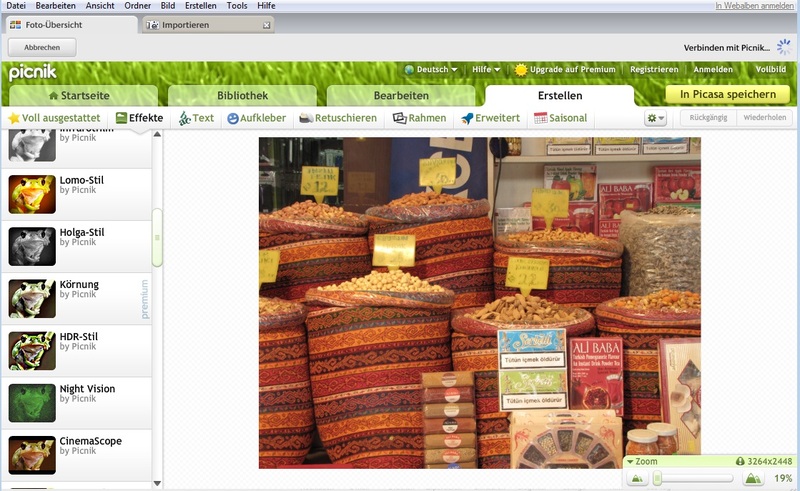 You can find all the files in the “Foto Übersicht” section. You are given the opportunity to create albums now out of all your folders. At the same time you can edit your pictures easily. There are many options, just normal red eye reduction, editing of color and contrast ad shadows. Picture can be resized and/or cropped. That is very useful, especially when you want to upload these pictures later and don’t want them to be too big in size. 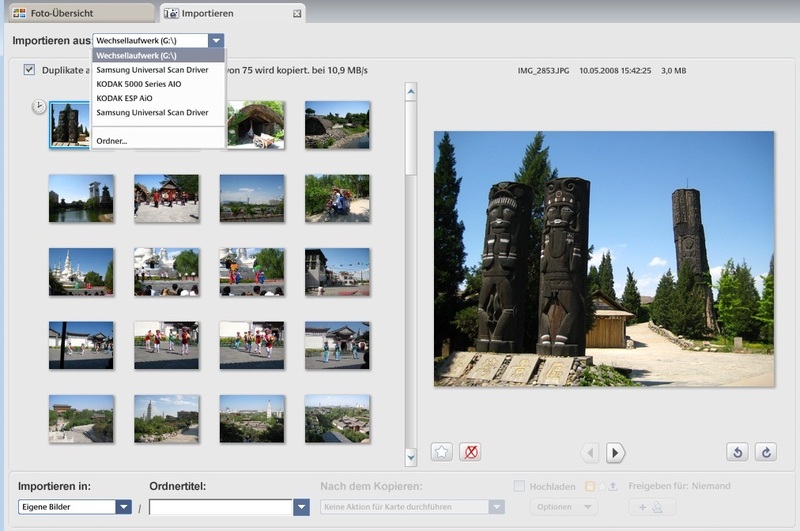 If you are a more professional user there is another tool called picnic which gives you plenty of opportunities to edit your pictures. This is an online application where the pictures will be uploaded to an online platform where you can work on them. After finishing they will be sent back to Picasa. This tool really offers many options. It is basically free but if you want to use some extra tools you will need to upgrade and become a premium member. After editing your pictures you can also tag people in them (That was new to me too). The program can recognize faces in pictures. You name them and have the possibility to sort your pictures by people who are in the pictures. You could decide further to create a video or slideshow out of your pictures which can be directly uploaded to Youtube. If you are a user of a blog Picasa gives you the opportunity to upload the pictures directly to your blog, which is very convenient because you don’t need to do it via the website anymore.As Picasa is a Google brand it is most useful for Blogger users, but I found a way to use it for WordPress as well. 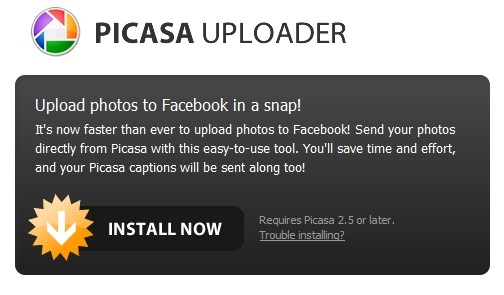 There is also the option to connect Picasa to Facebook. I honestly have to admit that I did not know that all the online applications are already connected with each other. Admittedly it takes some time to do all the installations and configurations but once everything is done it works very well and can save you a lot of time. There are so many things to do with Picasa. You can even use geo tagging via Google Earth. I think I found a lot of interesting features for myself and realized that you should only take some time and invest it in discovering new online applications. Once installed and understood they simplify life (especially important for work life later). Try it out ! There are many reasons why one can like new technologies and technological innovations. But on the other hand there are also many reasons that make me skeptical about this entire information sharing and digitalization processes. I always saw on the news ho w people’s passwords got stolen and they received an exorbitant bill for purchases they did not do. Unfortunately I am now one of them. I always thought things like that cannot happen to me because I am very careful with my passwords. But in a world where basically all your information is saved online there seems to be no way to protect yourself from abuse. I just got a notice from Apple that there was a purchase with my ID on a computer which was not used with this ID before. I was advised to change my password. I was scaptical in the beginning if this is a real or a fake mail. It was real and I changed my password immedialely. But of yourse if was too late already. Click&Buy just emailed me a bill of 80 Euros for the purchase of some online Poker App, which I never bought! Well, I am lucky that it was only 80 Euros and not 800 but still, the question is how to react now. Further I read the shocking story that hacked iTunes accounts are sold in China (http://www.idownloadblog.com/2011/01/14/hacked-itunes-accounts-are-being-sold-in-china/). I am totally speechless about that. I wrote to Click&Buy and informed iTunes and my bank about that issue. Further I will have to go to the police station. That is just so crazy…And I honestly hope I will get my money back. I am totally not convinced of all these online payment systems and I will remove all my bank data from the internet for sure. In my opinion, everything that is on the internet is not safe! As technology gets more complex the more ways hackers find to access your confidential data. Recent actions taken by Sparkasse and other banks prove that. From now on TAN lists can’t be used anymore. Due to the lack of security they switched to SMS TANs hoping that this is a better option. I think it is just a matter of time until hackers find a way to hack your cell phones as well. Even though technology simplifies ours lives I guess I will never become a big fan of it. Have you had any similar problems? It’s been almost 10 weeks since our very first blogpost and almost the end to our journey on this blog (but with every ending to a chapter, we start again a brand new one J) We wouldn’t call these our final words, but we wish to draw some closure to our very wonderful semester with blogging, with our Business Applications class colleagues and Dr B. and of course, with one another in our team. To overcome my fear of technology, I started getting to know Firefox better and how the add-ons for Firefox actually work. The first add-on I installed I did a few weeks ago, when I heard of HTTPS Everywhere. It is a Firefox extension that makes sure that the pages we visit are encrypted and therefore safe to use. HTML has really, to me, been a subject that I’ve long been wanting to grasp. With the final assignment being to, on our own accord, get to know any of a number of different programs, I decided to combine the two and practice some HTML using the Firefox add-on Firebug. This turned out to be a pretty much top-down approach to HTML since Firebug enables you to view the full HTML script of a certain website without doing much explaining. I realized very fast that I didn’t know anything, in fact, about HTML and it took a while to figure things out. I found it very helpful to spend some time trying out everything I could and getting accustomed to the concepts. I did eventually learn a lot about HTML like this. Every page has a characteristic structure: it is divided into a ‘head’ section, which details the website’s header and a ‘body’ which contains all the visible coding. Within the body there are again various sub-sections, each defining one specific block on the site. The blocks are further split up into the various components that make up the content (links, images, labels etc.). After initially being a little frustrated by the amount of information and my lack of understanding, it now really started to make sense. I managed to manipulate all kinds of components and changed whole websites. I believe that this way of learning is incredibly effective, fast… and fun. I feel rather secure in my ability to navigate an HTML document and it shouldn’t take to long until I start writing my own. Firebug has been a huge contributor and self-educating by just trying things out, is a very powerful approach. Business Network… Business version of Facebook. Do all of you already set up plans for summer semester break? some of you might work and some of you might go for travel, right? I am currently working at Investment research company here in Berlin.